Pretty much box stock, I added the vinyl top, opened the exhaust tips, and added the Keith Marks side stripes. Thanks for looking. Very nice. Got one in the works myself, Plum Crazy white top. Great work. It looks super. How did you do the vinyl roof? Thanks, I use plastic strips to simulate the seams and vinyl top trim. The top is stippled black paint, Folkart. Nice! Its a good looking car, thats for sure. 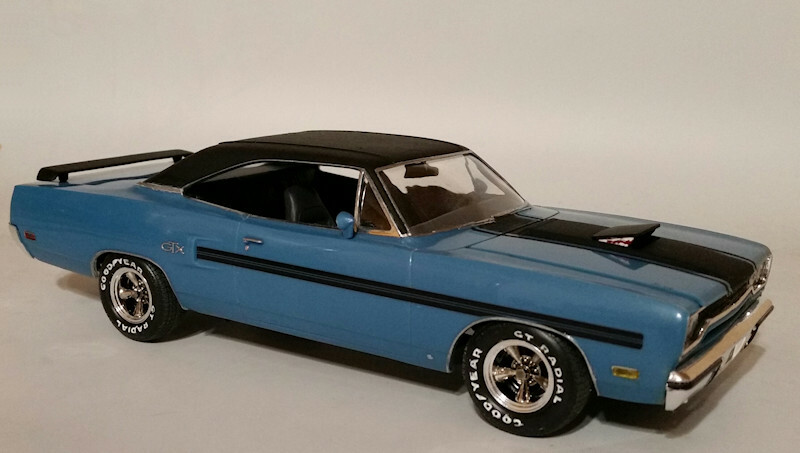 Very nice build on that GTX as I just love dem Mopar B-body cars. 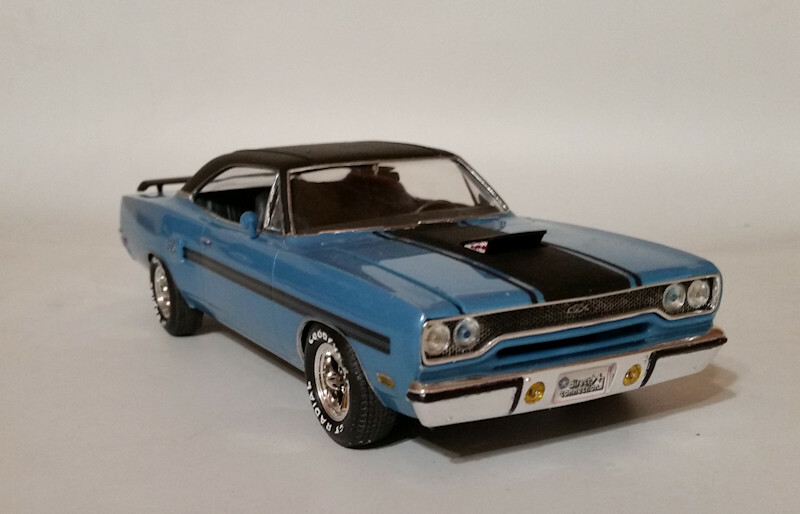 I finished a '70 Road Runner kit earlier this year. Thank you, I'm currently working on a 71 GTX by Monogram. I seem to be on a GTX kick lately. 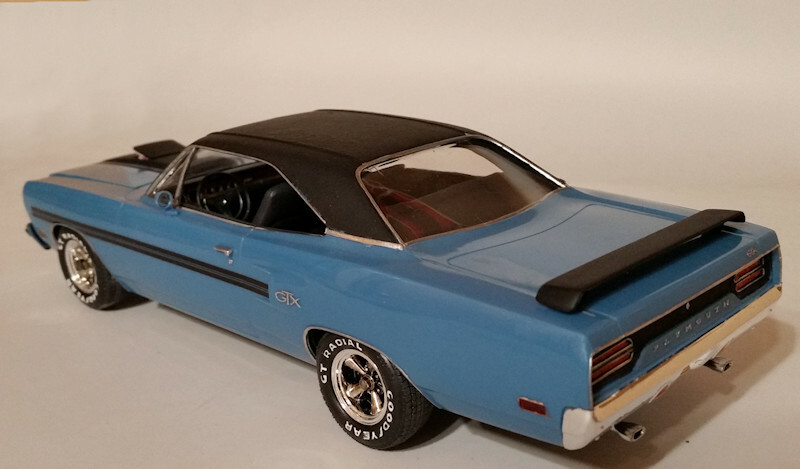 A GTX kick is okay as they're really nice cars in 1:1 scale and I even put a bid on one 'bout 10 years ago, but I guess it wasn't meant to be. I just love dem Mopars! The last mopar I had was a 68 Charger, it was pretty nice, and dummy me sold it thinking I can always get another one some day. Of course that was before the prices on the old B bodies shot up. Now it aint gonna happen unless I hit the lottery. I'll have to settle for 1/25. 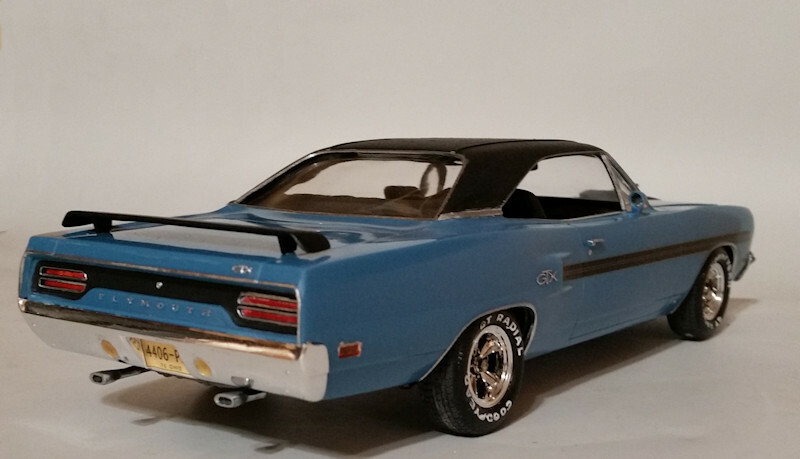 If you want another 1:1 Mopar, check out www.carsonline.com and you'll see all kinds of Mopars at a lot of different price ranges. Wow, love it! Well done! !